In the age of Tivo and other means by which viewers can skip traditional commercials–not least by downloading the shows–advertisers have sought numerous ways to get attention in the show itself. 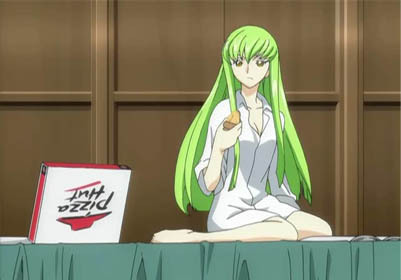 Product placement isn’t new, but aside from the ubiquitous Col. Sanders, I think the inclusion of numerous Pizza Hut logos in Code Geass marks some kind of turning point in the level of blatant endorsement and/or payoff within anime itself. Having not finished Geass, I am told that as a show overall it is of considerable merit and complexity, not least politically. Which makes the product placement all them more bizarre and illogical in a way. Think first about the context of the show’s setting. It is set in a Japan taken over by an alternate-history British Empire, even if it is in reality a stand-in for the United States more than Britain. It is a British empire in which Pizza Hut somehow still developed and exists, catering to the greasy thick-pan-crust desires of Americans, and it seems to be just as ubiquitous in Japan as well. (The last part is not so unbelievable; the current generation of Japanese young people are as into fast food as much as any other group of young people all over the world, to the point of increasing obesity.) I am told that there is even an incident in the anime where the character is collecting Pizza Hut customer stamps in order to earn a prize. Unless they somehow really, really cleverly integrate that into the plot somehow, or are deliberately producing a satire, that is just. so. naked. Admittedly, I laugh just thinking about it. It’s so blatant as to be funny, which lasts as long as I’m assured that this is going to be an exception, not a rule, for anime to come. Anime has always of course been commercially sponsored, and the logos and references to a same studio’s other work has appeared numerous times (think Lucky Star). In the end what matters is the storytelling; and the commercial sponsors have to realize that any blatant CHEESINESS (pun intended) on their part into the story makes them look worse, not better, in the eyes of anime fans. As it is, when my anime club had planned on showing the first couple of episodes of Geass, we even ordered Pizza Hut delivery to tie in with it. We basically did exactly what Pizza Hut was looking for when they decided to put these placements in the show. If future anime starts having entire episodes about how without the cheesy goodness of stuffed crust pizza the world is going to end…well…let’s just say that the grease is not going to settle down well in our stomachs. Oh man. Even though I just had dinner–why do I feel the need to eat some Pizza Hut pizza now? Previous PostClannad 10-12: Antisocial is the New MoeNext PostKimi ga Nozomu Eien, Next Season 1–Is This the Same Takayuki We Know and Hate? Seen Darker than Black’s product placement? Those are way, way worse. Just for your information, PizzaHut only paid for minimal screentime via background cameos. They weren’t suppose to be integrated into the script. The PizzaHut representative was shocked when he saw a PizzaHut delivery-boy in an episode. None of this was a cooperate decision; The production team just thought that it works better this way. The Pizza Hut cameos in Darker than Black are far, far tamer IMO; I don’t know what omo is thinking of. No one is actually seen eating Pizza Hutpizza , let alone saving coupons and order specific items. That said, I think it’s a good match for the cheesiness of the story, which is exactly why it works. The fact that C.C. seems to subsist entirely on Pizza Hut delivery is no more non sequiter than anything else in the series, and it makes for a good humor point. Thanks for the information, everyone. I haven’t watched enough Darker than Black, either, but for some reason I cannot recall any Pizza Hut product placements in that show, whereas they were immediately obvious in Code Geass. Maybe it’s my eyes.